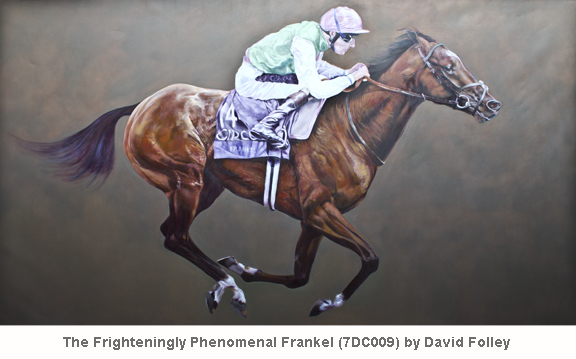 The first time I visited David Folley’s studio on September 07th 2013, he was working on his life-size image of the greatest race horse in the world – Frankel. I was surprised to behold an imagined vision of the painter. After the 10 minutes introduction formalities by Ms. Weise, my project leader from Germany, we had time to exchange contact and website details. I briefly had the opportunity for a short insight to David’s creative process. Nine days later, on Monday September 16th I arrived at his studio at 9.30 am. He surprised me once more with his breath of mind; with his brilliant ideas, he strikes me as a bundle of energy and is constantly on the go. Unfortunately, my understanding of his lucid discourse was partly disjointed due to my need to regurgitating his spoken English into German. As a painter myself, working with David is educational and inspiring, even though our styles, method of working and results are totally different. Nevertheless, working with an established painter from England will provide me with an overview of the art business in the UK and will give me something to think about when I return to Germany. David’s has wide business interests and has recently formed a Community Interest Company (C.I.C.) called Discover The Arts. This company is a social enterprise business and David has created the business to service the needs of art practitioners and creators. To further his project, I accompanied David to the University of Plymouth to meet Simon Pethereck and Bertel Martin. 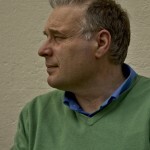 Simon is a writer and Bertel organises the annual ‘Plymouth Literary Festival’. This week, I had an introduction to photo shop. David is designing a newsletter to send to his many collectors. When it is completed it will be a substantial publication! I’m looking forward to ‘trans-concepting’ the newsletter’s text rather than just translating. 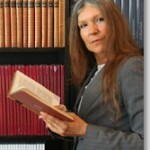 Trans-concepting is when the writer attempts to interpret the text with the feeling of the authors original language. This will be challenging for me, because many words have convoluted meanings and interpretations. To develop my Excel database knowledge further, David has given me the task to design a new database about racing horses. This database will enable him to pick a winner, although he is not using this database just for betting purposes! 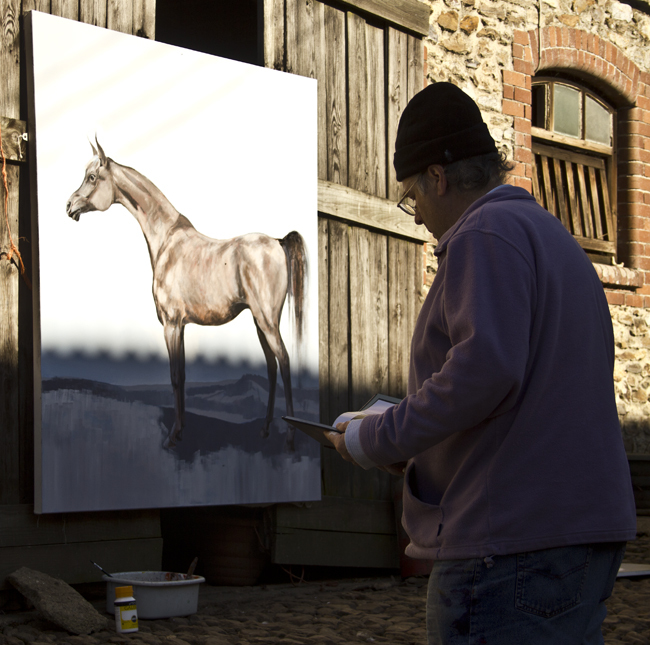 The database will be a quick and assessable method for David to choose which horse he would like to paint next. This painter’s ‘obsessive’ research is meticulous. My next task was to start my trans-conception of David’s experiences of painting an arabian horse which was first published in the Arabian Horse Society’s Yearbook for 2012. Working on the text changed my opinions of the arabian horse as a bred. I had always considered the arabian as skittish and disorientated, with no trust in people. While working on David’s text, his experiences and the views expressed by his equine mentors has changed my perceptions. To provide an overview and insight into David’s business interests we began to design a mind-map or to use David’s term – a‘shower thought’. On a large wall size sheet of paper we wrote names and descriptions of the different elements of these companies on different colour ‘stickies’ self-adhesive notes. The wall appears now to be full of large pieces of confetti! So many ideas, so much confusion! However, out of this confusion the exercise has made order. Some challenges I found while trans-concepting for David where the different interpretations and cultural meanings given to words and phases. For example: the English use the word ‘breed’ to describe a species having a distinct appearance. The ordinary translation of the term ‘breed’ would be to bring a male and female together to breed or produce off-spring. This of course is not what was written. Breed in the original text by David means the distinct appearance of horses. General office duties also included writing International business letters on behalf of David. It is surprising how much varied and wide ranging the office work is at the studio. The office work also included photographing and cataloging David’s artworks. He is scrupulous in his administration and committed to record all his ‘children’ an affectionate term he uses to describe his artworks. While working in the studio I mentioned to David an idea for this year’s Christmas Card. He thought it was such a great idea he has cancelled the design planned for this year in favour of mine. My final trans-conception for David was an exhibition introduction by David, The Lord of Warleigh. The text explained how David is the: Accessible Painter to the People. How can I sum up my experiences working for David! It has been a real insight working in a busy studio; I wasn’t prepared for the vast variety of different office skills and experience required to an active member of his Studio team. To conclude, it was an honour and pleasure for me to partake in this internship and to have the opportunity to gain valuable transferable employment skills from a man with a big heart for horses.